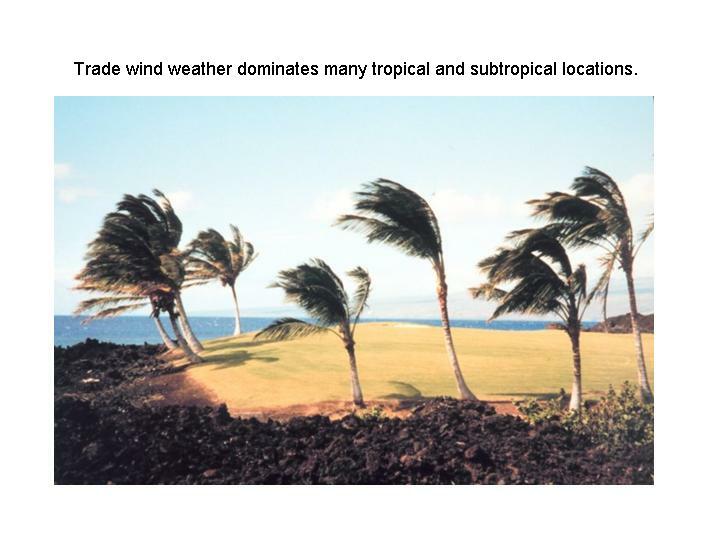 "Trade winds" are the persistent, mostly-easterly, flow of the near-surface winds over the tropical oceans. This persistent flow is the result of huge, semi-permanent high pressure zones that exist over the tropical and subtropical oceans. These high pressure zones are partly caused by the relatively cool ocean water (compared to the warm land air masses), especially over the eastern half of the ocean basins. The trade winds are only interrupted by the passage of tropical cyclones, or an occasional cold front arriving from higher latitudes.